Pinterest – whose image is it anyway? So an awful lot of us have been getting into Pinterest lately. For those not yet signed up, Pinterest lets you ‘pin’ images from around the web, sort them into ‘boards’ (themed by interests such as crafts, music, art, style etc) adding your own comments, sharing them with your followers and vice versa. According to stats published in Monday’s Metro, Pinterest now has 11.7m users worldwide. with 200,000 users in Britain. Its trajectory of growth makes it one of the fastest growing social networking sites ever. What’s not to love? So basically you’re granting these guys at Cold Brew Labs the right to use your images in any way they wish, forever and ever. And what if you upload someone elses’s images that had previously not featured on Pinterest? I have just created a board called Sewing Friends Super Creations, wherein I pin pics of fabulous projects from blogs I follow and love. 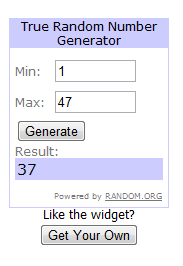 (I should add I also provide a link back to your blog!) Is that wrong now? Will my sewing chums worry that their images will be abused or used in some nefarious way? There is a way to protect your blog images from being used. Pinterest has provided a line of code here that you can add to your site if you don’t want your pics to be pinned. I for one, won’t be using this code. I’m pretty relaxed about content-sharing, especially within the sewing blogosphere. I’ve never heard of anyone trying to pass someone’s else’s work or art off as their own. But what do you think? Would you prefer your images not to be shared and distributed, with little or no reference back to your site/blog? Do you sell your projects online, and worry that perhaps attribution may be lost as your images are shared over and over? Does it bother you that your image is being put out there by people you don’t really know? I’d also be interested to hear from you if you’d prefer me not to share images from your blog as I’d hate to offend anyone! As I declared on Friday, over the weekend I THREW myself into catching up on the Minoru sewalong with Tasia. After two hours on Sat and about five on Sun, I’m almost up to date. Tonight I’ll be finishing off the lining and putting it into the coat. 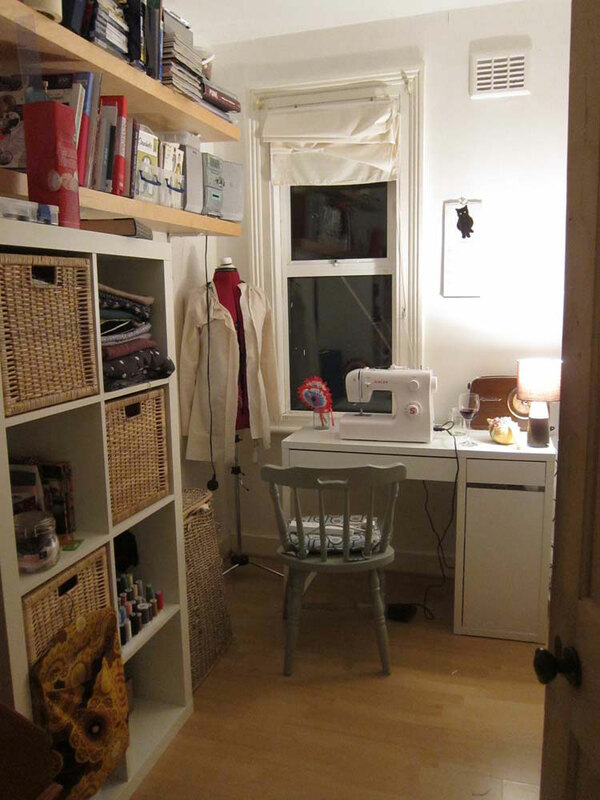 My new sewing room is a joy to work in! Here’s a few pics from the work in progress. I knew I would like the combo of grey corduroy and electric blue polkadot lining but I didn’t know I would FALL IN LOVE with it. Here’s another pop of colour in da hood. Yes that’s right – da hood. Don’t judge me. 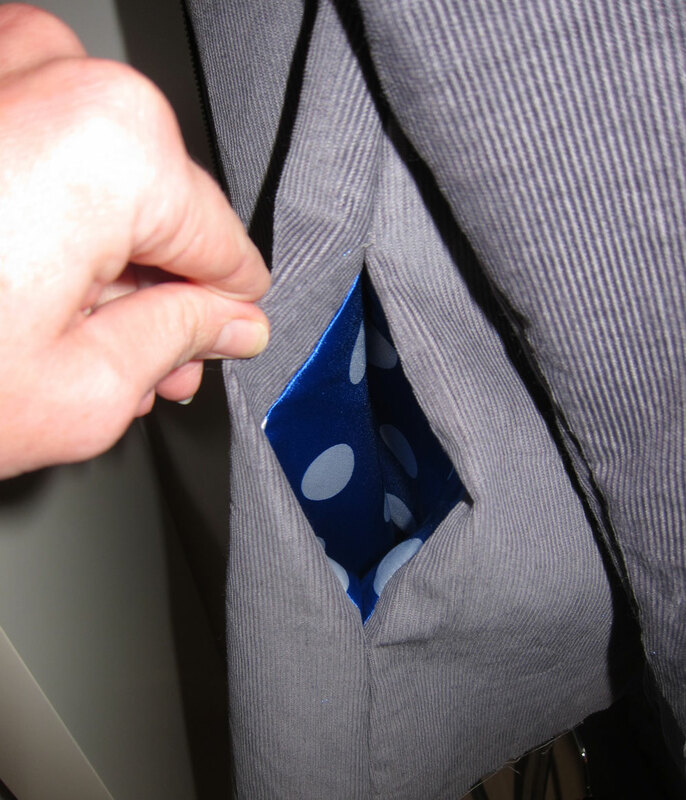 I used Amy’s excellent tutorial to install side pockets using leftover lining material. By the way, have you seen Karen’s Minoru? It’s adorable. I love the front pockets she’s added. Yes dear readers, I have been procrastinating a bit this week. I’ve not had a go on my sewing machine since I came back from holiday, except to run up a quick ruff for my niece’s Elizabethan project. What. A. Bloody. Mess. I am ashamed of myself. The wires! The fabric stash! Ugh. Check out that cabinet. What a beast. Let’s take a look inside it. 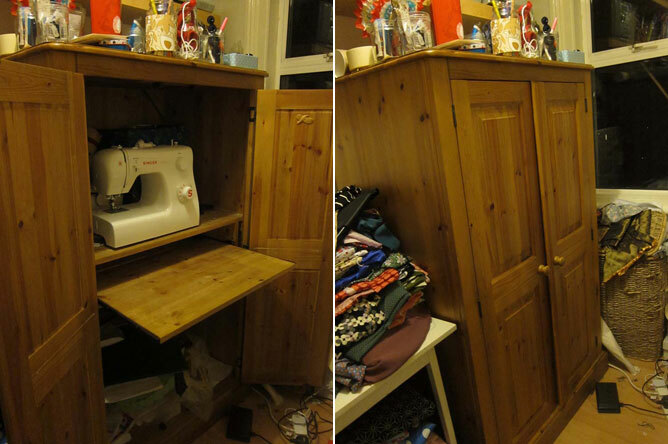 Now you may not believe it, but when I bought this cabinet on eBay for £100 I was dead chuffed with myself for coming up with such a clever solution to tidy away everything out of sight. Hah! What a fool am I! I got the idea from Weekend Sewing by Heather Ross, one of my first sewing books. But wait – this is HER version of it. Mine never quite… lived up to this. It also blocked out a lot of light from the wee side return window and restricted my ‘sewing elbows’. It was time to get rid. Off it went to a lovely gentleman called Adam on Freecycle, and off I went to Ikea to purchase more suitable pieces. 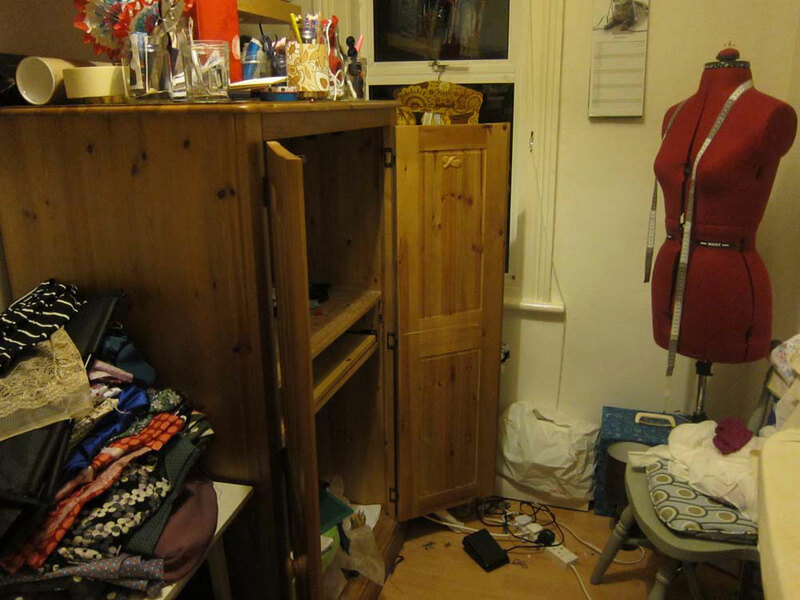 And now…da da da daaaaaaah – here is my new and improved sewing room! Feel the zen. Feel the potential. Ahh I love this so much. I spent an hour in here yesterday just pootling about and looking at things. Here – let me take you on a wee tour. Do you have the time? 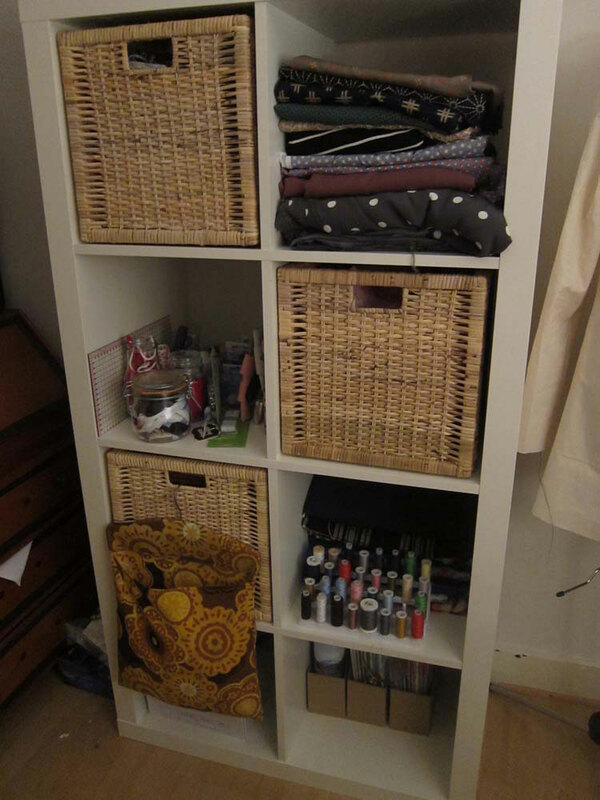 The stash has been tamed – you can see I’ve got some there in the top bit and further down behind the threads but the rest is in the wicker baskets. Second shelf down to the left is the haberdashery, replete with gadgets and gizmos I bought on a whim and don’t know how to use yet. 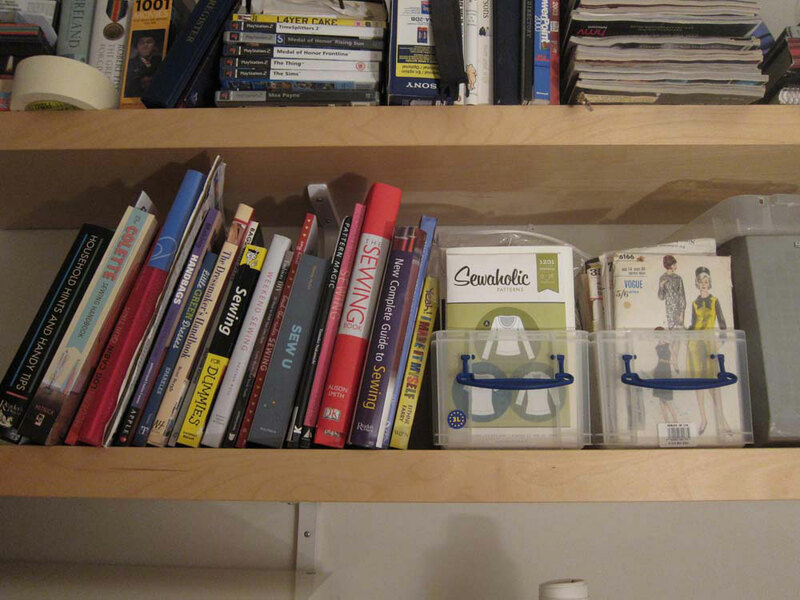 Here’s my little library of sewing books. Yes that is Sewing for Dummies! You can probably just make out a tiny yellow book beside the patterns – Yeah, I made it myself! by Eithne Farry. I blame her for starting me off on this path. TBH I wouldn’t be seen dead in some of the things I made from that book but it was an excellent resource for someone who was frightened but fascinated by sewing. And of course – there is the new bible of sewing clothes – the Colette Sewing Handbook. 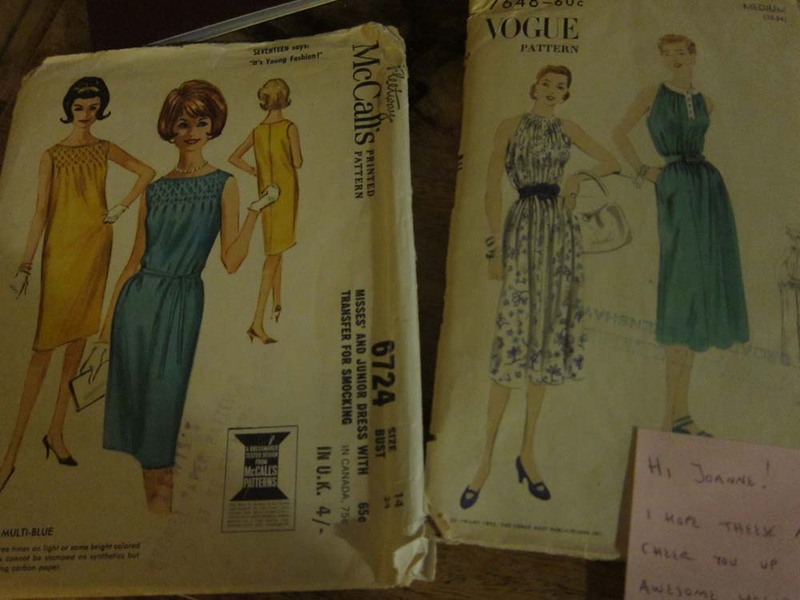 To the right I have my modern and vintage patterns. Renfrew – I yearn for you. But you’ll just have to wait damn it. Let’s move to the desk! Ahh how tidy it is. (That won’t last long.) The radio is tuned to BBC Radio 4 at the moment, if you were wondering. I can’t get BBC6 music as it’s not digital. 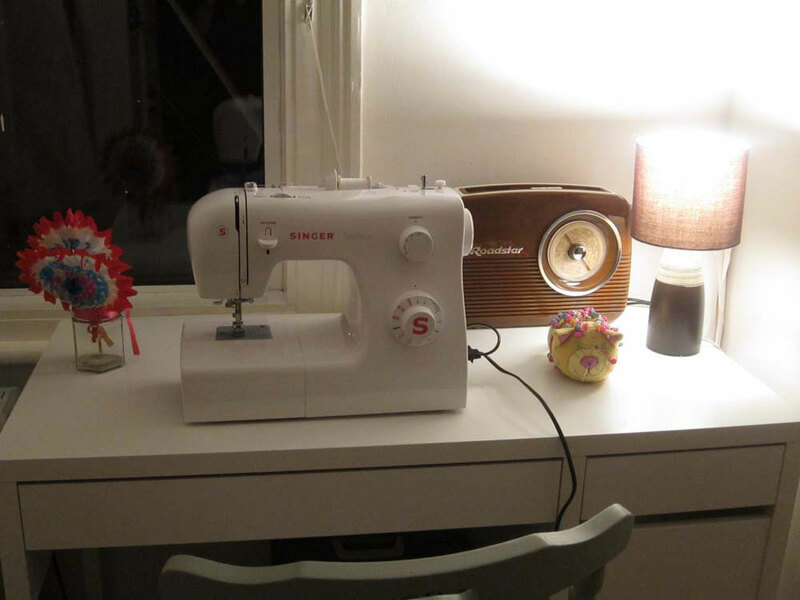 I like to imagine I will improve myself as I sew but I’ll bet I turn it over to Radio 2 the first chance I get. 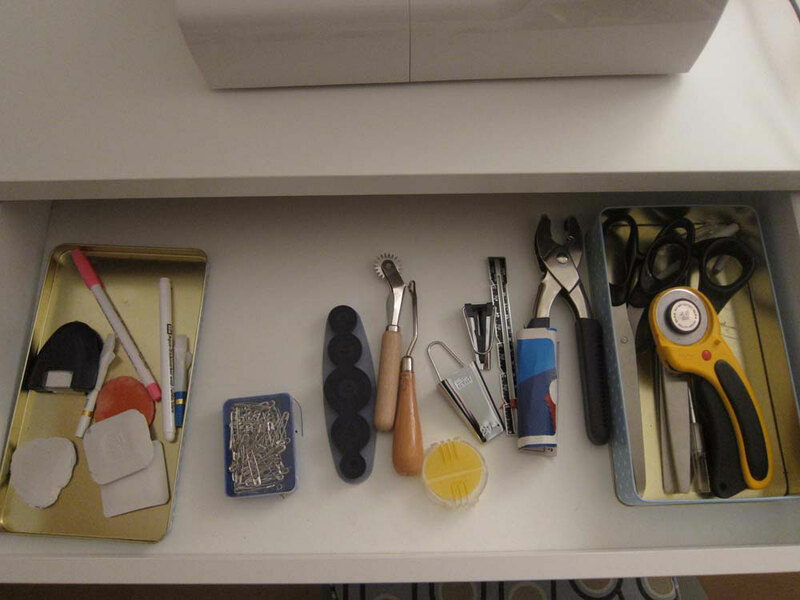 The drawer directly underneath the machine houses my pattern cutting and marking tools. 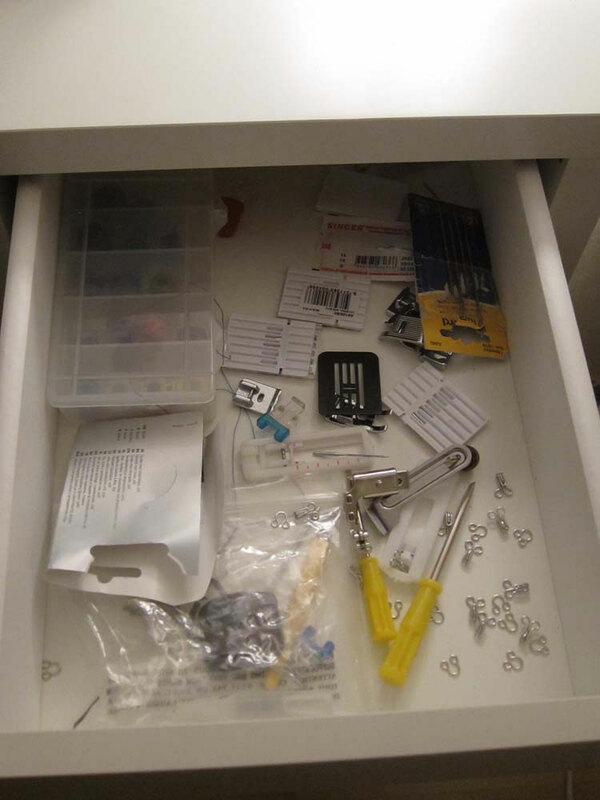 And the drawer to the right has all my little sewing feet, needles and tools, plus a combusted package of hooks and eyes (damn those evil things – I know Jane will agree with me there). Here’s my (rather uninspiring pinboard). This needs to be a lot more colourful than it is at the moment – any suggestions on how to brighten it up? 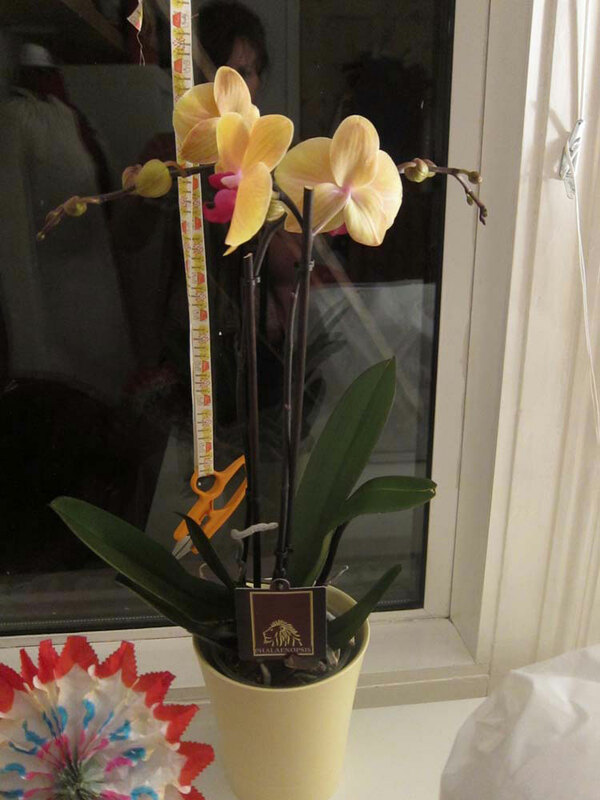 Awh – from the husband! What a sweetie. He popped over to the garden centre today to get it. He gets mucho brownie points for this one. Well that’s it – hoped you liked the wee tour. I can promise you I will no longer be procrastinating and will THROW myself into the Minoru tomorrow. Disclaimer: If this all goes t*ts up, please don’t be disappointed in me. Fact 1. I love Mad Men. I’m a relative late comer to the series and had to catch up using certain nefarious websites and DVD box sets, but now I’m absolutely 100% hooked. Fact 2: I love Julia Bobbin. Her dresses are always super-cute and flattering and her pics are to die for. She’s also a dab hand at adapting and creating her own patterns. 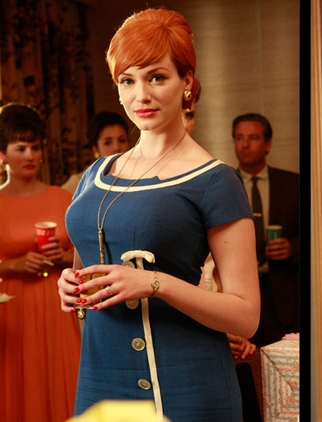 Fact 3: Julia Bobbin is also a BIG fan of Mad Men, and when I say fan I mean she’s openly admitted to hunkering down for the night with binoculars just outside their open windows (in her head anyway). 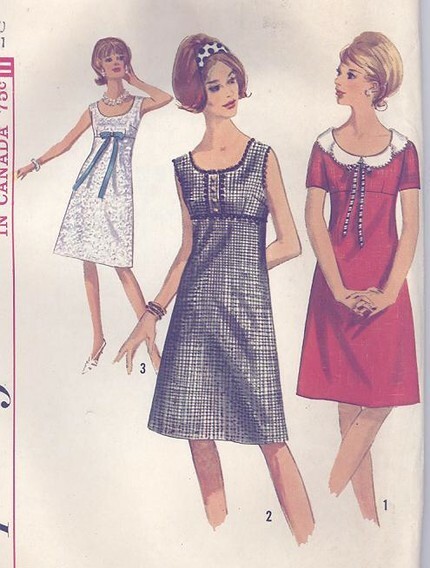 Fact 4: Julia has thrown down the gauntlet to stitchers everywhere with her Mad Men Dress Challenge: Recreate a dress from the series by the end of March. Fact 5: I must be certifiably insane as I have signed up. Fact 6: I have no more facts so let’s stop this nonsense. Yes, it’s true. Despite the fact that I am woefully behind on the Minoru sewalong and I’ve signed up to Tilly’s One Pattern, One Week challenge which entails making at least another – possibly two – Violet blouses, I said YES JULIA. I quite literally dribbled when I read Julia’s post. I may have had a little cry too, right there at my desk. It’s just too wonderful to resist. Julia has created the most divine version of this dress. I only wish I had her skillz in being able to draft patterns, but after a long search I think I’ve come up with a pattern to fit. I hope she doesn’t mind me shamelessly copying! I’ve just purchased Simplicity 5961 on Etsy. I think the empire bust line is perfect and in fact the A-line skirt will be more wearable for my small height. I really do want this dress to be something I can wear a lot. I’ve already chosen and purchased two metres of royal blue pure wool crepe from Truro fabrics. Sheeesh – it was expensive. 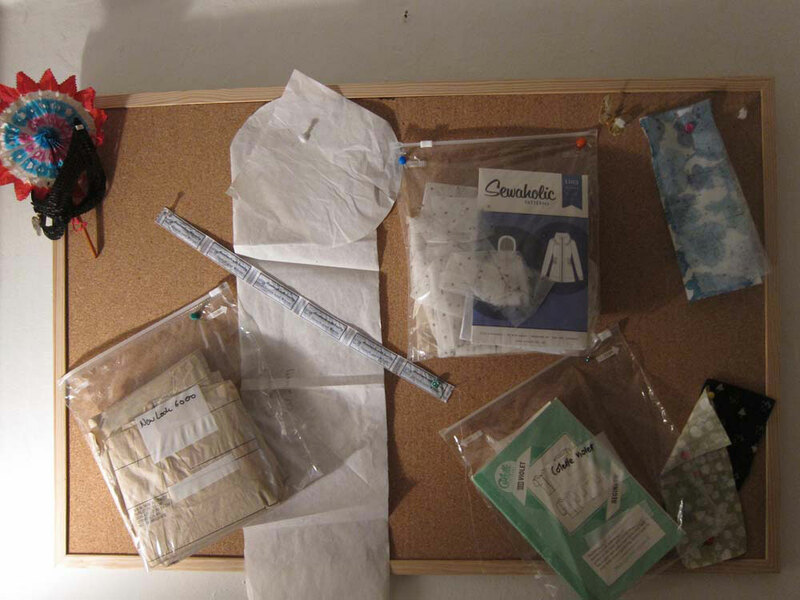 Whoever said making your own clothes is a money-saving option needs their head read. If you’d like to sign up to this awesome challenge just mosey on over to Julia’s blog where she has a button and deets all waiting for you. Well done Forrest! Pop me an email on Joanneelewsley@gmail.com with your deets and I’ll get the silk off to you! Holiday show and tell – with worms! Whilst staying in Luang Prabang on my recent holibobs, I cycled to the outskirts of the town to a textile gallery and weaving centre called Ock Pop Tok, beautifully situated right on a peaceful bank overlooking the Mekong. 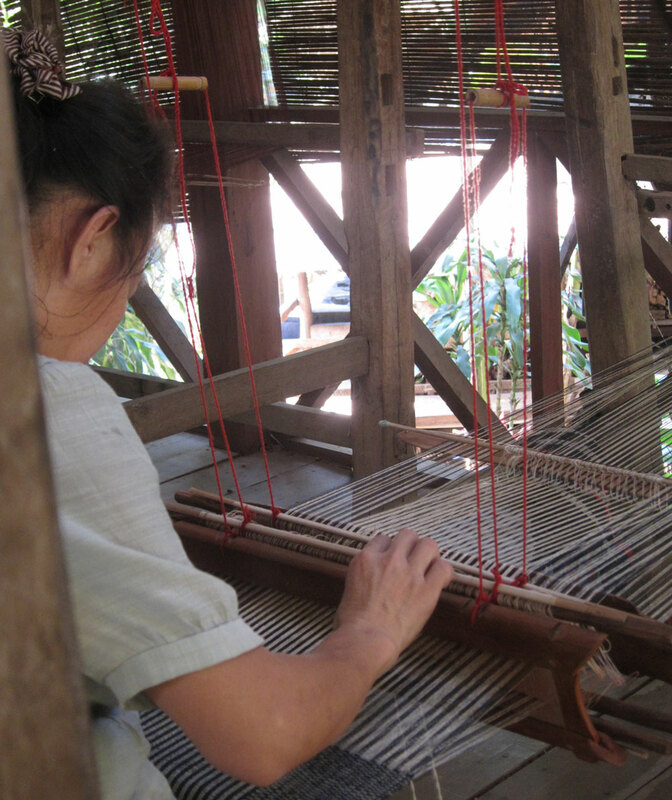 Founded in 2000 by a local Lao weaver and an English photographer, the centre aims to preserve traditional Laotian methods of weaving and silk-making. You can check out the ladies while they weave away on their looms, take a class yourself, browse the gallery and shop or even stay at the centre. We just rocked up on our bikes to check out the shop and gallery, but one of the lovely staff offered to give us a quick tour, so we jumped at the chance. To those of a nervous disposition – look the feck away now! 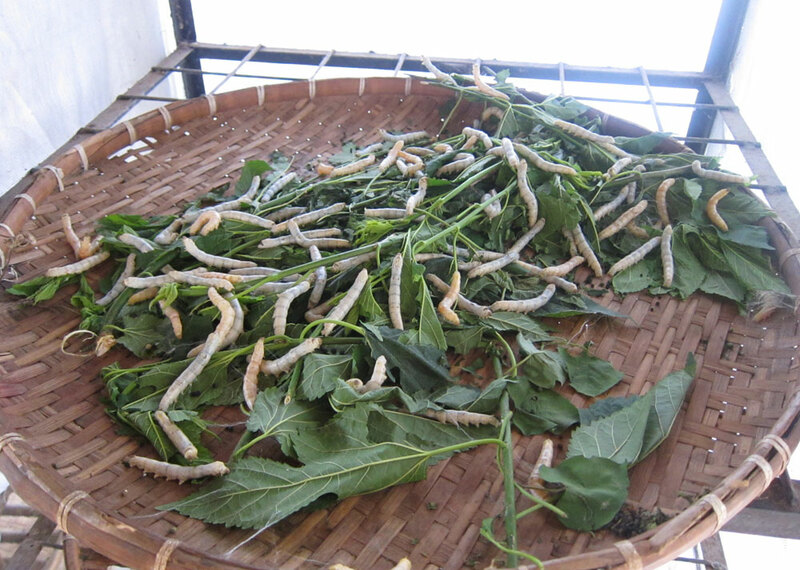 Readers – these are silk worms. And I touched them. They’re not slimy at all – they’re quite soft and benign. Which is nice to know considering they go on to make the most beautiful silk – see below. They eat mulberry leaves all day and then after about six weeks they go into the chrysalis stage, spinning a fine silk cocoon around themselves. Unfortunately (and I make no comment on this since I love meat and wear leather shoes etc) to get this cocoon for our silk-making purposes, the worms are not allowed to advance to ‘moth’ stage but are instead killed by heat, in order to preserve the silk. The silk is then dyed using a variety of natural substances – leaves and bark, plants and even something called a ‘forest potato’. The sheer variety of colours using these dyes was amazing – just one dye can produce a range of colours just depending on how long you boil it for. These beautiful colours are then selected to make stunning Laotian textiles – scarves, wall-hangings, clothes, bags, you name it. When we visited there were just a few ladies weaving away (it was a Saturday) but there could be up to twenty looms all going at the same time. The centre is based on ethical, fairtrade principles. Interestingly, we were told that whilst silk weaving is very much a female skill and practice, bamboo weaving is something that traditionally Lao men were skilled in. Sadly much of this artistry is being lost, whether it’s down to Western influences of commerce and big business or because there are less and less traditional ‘country’ village practices and events that call for traditional textiles as part of the festivities. The centre’s aim is to preserve and encourage those skills and get a fair price for them in the process. Many of the products were quite expensive, even by Western standards, but when you compared the quality of the items to the cheaper (mostly mass -produced and imported from China but marketed as ‘traditional’ and ‘artisan’) products in Luang Prabang’s night market, you could see and feel the difference. It was such a lovely afternoon I thought I’d share my few pics of it with you. If you ever get the chance to go to Laos I’d heartily recommend a visit. I only wish I’d had enough time to take a class in weaving. But then it’s not a very portable hobby is it?! I’ve been gradually getting back into the swing of things after my trip. I’ve fallen asleep three nights in a row on the sofa though! How come it takes longer to adjust to your old time zone than it does to your holiday one? Anyhoo, I was finally compos mentis enough to start opening my post yesterday. To my delight, one of the packages was from the wonderful Marie of A Sewing Odyssey; I won her marvellous pattern giveaway just before I jetted off. What a fabulous home-coming present it was too. Don’t you just love the detail across the yoke on the McCalls? Is that pin tucking? I adore it. And the Vogue dress is so glamorous – these will both be PERFECT for summer. Thank you so much Marie for these and your lovely note! 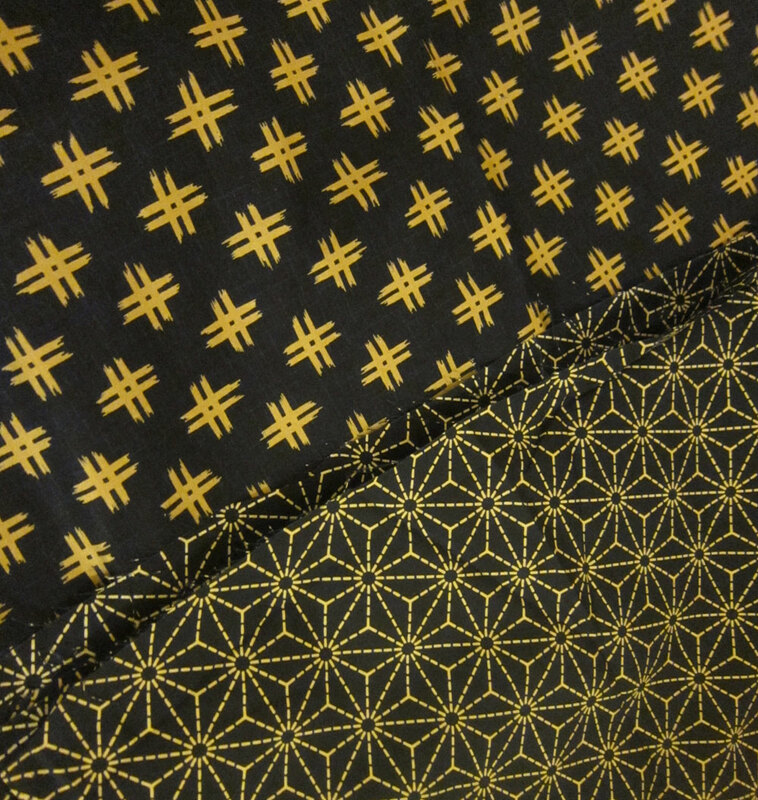 Also yesterday I received a truly unexpected present – of two rather gorgeous fabrics, from Japan no less! They were donated by a friend who had earmarked them for table linen but had since decided to go down the minimalist all-white route. My luck was in! Two metres or so each of this beautiful cotton. Love the patterns. Cassy, I salute you! Of course I’m tempted to use both of these for the Violet but I must desist from making up this pattern AGAIN for the time being. I’m so, so hideously behind on the Minoru sewalong. 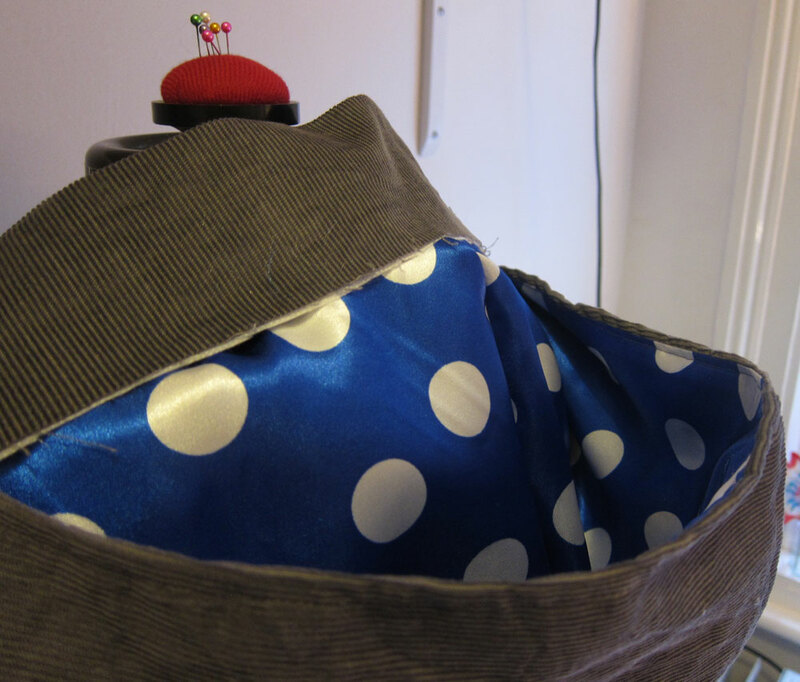 I’ve only cut out my fabric so far – how bad is that? 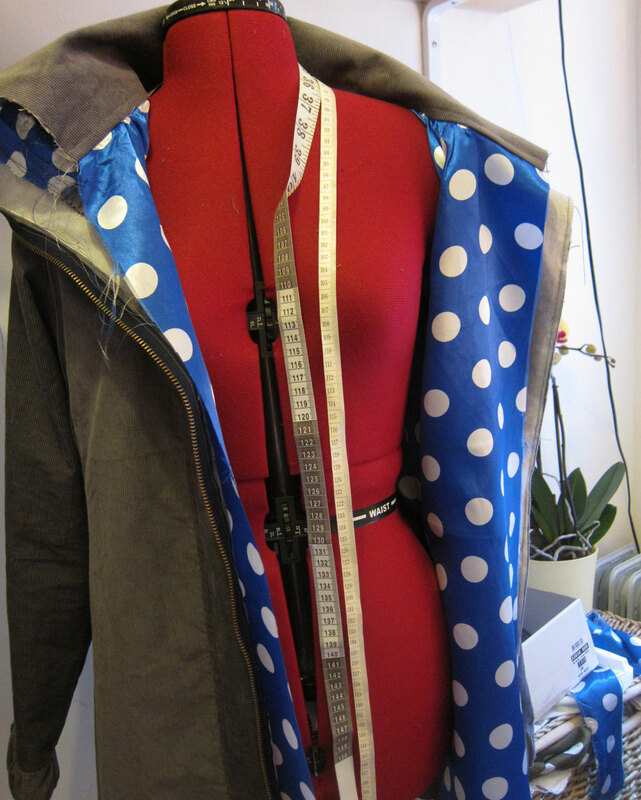 By the time I finish this coat we’ll be breaking out the BBQ! There won’t be much sewing done this weekend either as my lovely sis and niece are popping over from Belfast. We’re going to scare ourselves witless at the Blood and Tears tour of London’s darkest, bloodiest history, click our heels together at a Wizard of Oz matinee and have a pint of Guinness on the beach at Whitstable. Howzat for a weekend?